An extremely rare type of caesarean section – “veiled birth,” was performed and captured in a photo by Greek obstetrician Dr. Aris Tsigiris. The newborn baby is in its amniotic sac, which is completely intact. The most amazing thing is that the healthy baby can begin breathing as soon as the sac is ruptured. Dr. Aris Tsigiris, an OB/GYN operating out of Marousi, a suburban city northeast of Athens, shared this breath-catching image on the Facebook page of his medical practice. 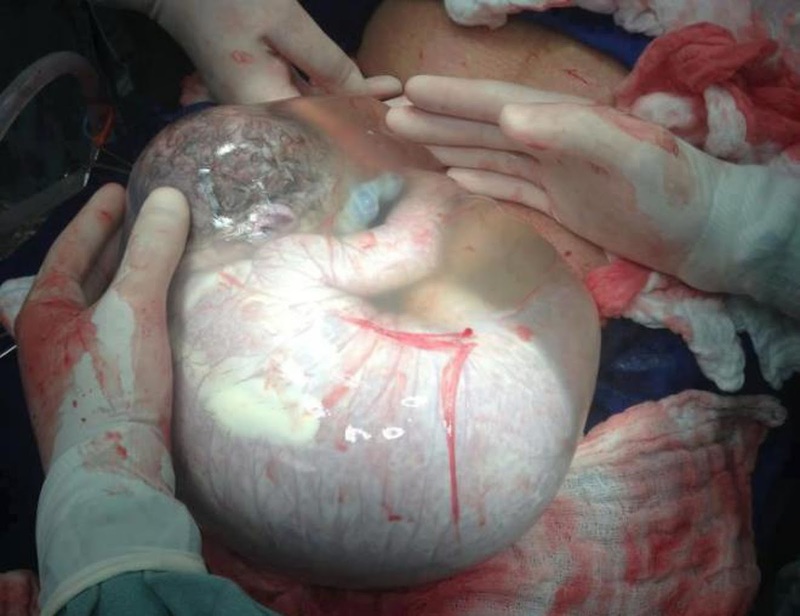 The newborn baby was delivered surgically by a caesarean section and can be seen floating in its amniotic sac as if still in the womb. According to Dr. Tsigiris, this type of delivery in which the baby behaves as if still in the mother’s womb, although taken out, is extremely rare. This is an amazing example of how unborn babies act while inside the fluid-filled membrane – the amniotic sac, which cushions, protects, and nourishes them as they grow. While most labors start with the amniotic sac rupturing and the amniotic fluid flowing out of the birth canal, something referred to as water breaking, this uncharacteristic type of delivery in which the baby is still surrounded by the amniotic membrane is known as an “en caul, or “veiled,” birth. According to medical statistics, less than 1 in 80,000 babies are born with a caul, and this more often happens in pre-mature deliveries. As found in a 2010 study, cesarean deliveries en caul are actually beneficial for protecting fragile premature babies from pressure trauma in the uterus. Although it may seem distressing for a baby to be born surrounded by a watery bubble, Dr. Tsigiris assures that the newborn is at no risk of drowning inside the bare amniotic sac, since the baby is still fed nutrients and oxygen through the umbilical cord of the placenta. Once the amniotic sac is ruptured through a simple surgical procedure called an amniotomy in which a thin hook opens the membrane, the baby instantly takes its first breath of air.